Writing about February birding, here in mid-January, I can only hope that the good times, spelled r-a-r-i-t-i-e-s, continue! A plethora of unusual birds has been located this winter in our area, many of them still lingering here at the time of this writing. How many will still be around in February and how many new ones will be discovered in the upcoming weeks remains to be seen. The biggest news in birding this winter in North Carolina is our first record of Golden-crowned Sparrow that was discovered in late December in Harbinger. This is a bird of the west coast, from Alaska to California, where it is fairly common. How and why those tiny brown wings brought it from the West Coast to the East Coast is anyone’s guess. Conveniently, it has stayed put in the same acre of habitat since it arrived, much to the delight of hundreds of birders. A Dickcissel has been feeding with it. A couple of Trumpeter Swans have been seen so far this winter, one on the Alligator River National Wildlife Refuge and one on the Mattamuskeet NWR. In huge contrast to the 1-ounce sparrow, Trumpeters are our largest swans, weighing in at a whopping 25 pounds. They were driven to near extinction in the early 20th century, but conservation efforts are bringing their numbers up. While still rare in the eastern United States, reports are increasing. Another western species of waterfowl that is rare in the east, a Ross’s Goose was spotted among a flock of Snow Geese at Pea Island in late December, during the annual Christmas Bird Count. A few of these tiny white geese are seen each winter in coastal North Carolina. Any time that you have a large number of Snow Geese present, you stand a fairly good chance of finding a Ross’s Goose — if you can spot it, Your best bet is on the Pocosin Lakes National Wildlife Refuge, where the huge goose flocks feed in farm fields. A northern species of sea-duck rarely seen in these parts, a female King Eider, was observed and photographed in early January along the rocks at Oregon Inlet. Unfortunately, it has not been seen since. King Eiders nest in the Arctic and normally spend the winter only as far south as New England. They can dive as deep as 180 feet in search of food. Another (seasonal) sea-duck has been more cooperative. 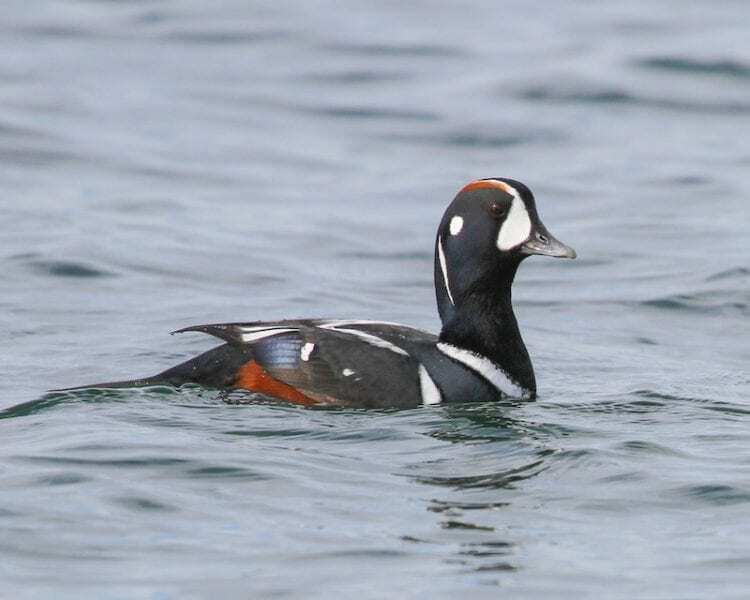 A male Harlequin Duck was discovered in Oregon Inlet in mid-January and was still being seen at the time of this writing, hanging out around (and under) the Bonner Bridge. Harlequin Ducks are fascinating. These small ducks breed along turbulent streams in the northwest United States and Canada and prefer rough water, even when wintering in rocky areas along the Atlantic and Pacific coasts. 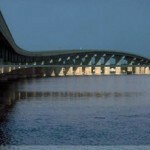 Bridges are apparently a good substitute for rocks. 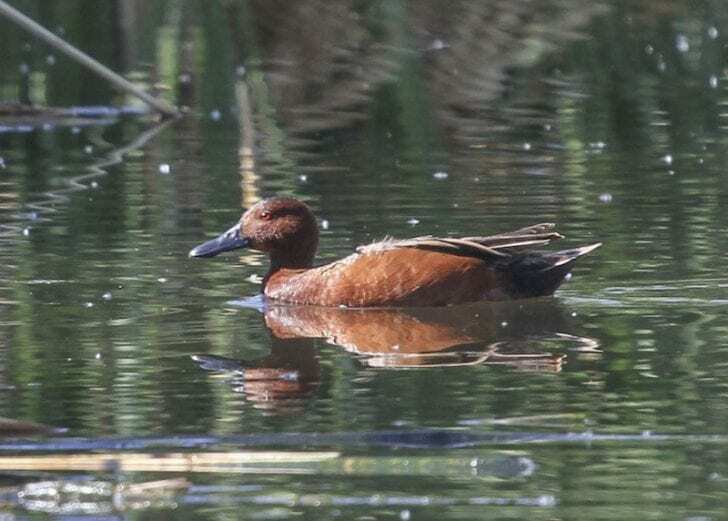 A very-rare-in-the-east male Cinnamon Teal is currently hanging out in a flooded field on the Alligator refuge and is currently being enjoyed by many birders. This stunning red dabbling duck is normally found in the western U.S., where they breed in shallow marshes and ponds. In the same field is a Eurasian subspecies of Green-winged Teal, Common Teal, another rare bird for North Carolina (and the U.S.). 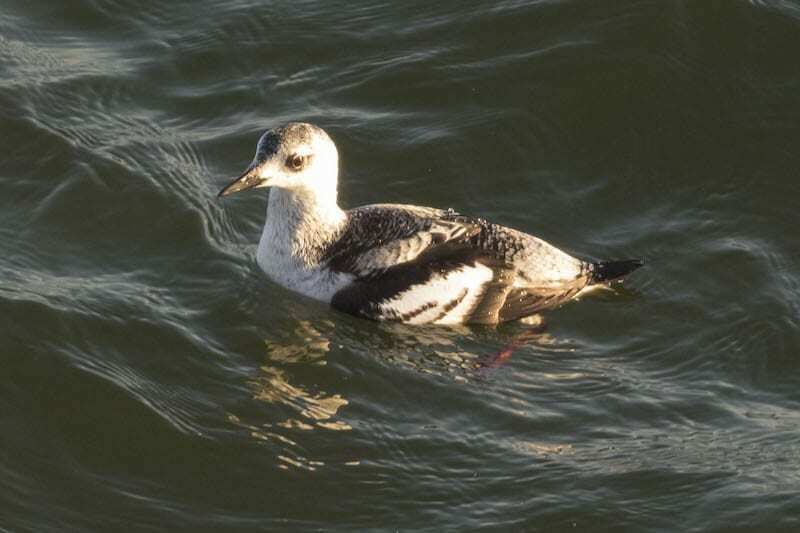 North Carolina’s third record of Black Guillemot was seen from Jennette’s Pier on Dec. 26. Although it hasn’t been seen since, it could still be around. Guillemots are a member of the Alcid family, oceanic birds vaguely resembling penguins. These birds dive for their prey, often reaching great depths. This is turning out to be a good winter for Alcids in North Carolina, with many Razorbills being seen, as well as a few rare Dovekies and a very rare Common Murre, which was spotted on a pelagic birding trip in mid-January. A trip to sea is normally the best way to get good looks at these fascinating birds. A couple of Red-necked Grebes have been seen this winter in our area. One was in the salt pond at Cape Point and one was in the ocean at Coquina Beach. The salt pond bird is probably still present. Bring a spotting scope. Moving away from the water, and always rare in North Carolina, Golden Eagles have already been seen a few times this winter, here in Dare County (usually on the Alligator refuge) and also in Hyde County. Normally found in mountainous areas of the Western and Northern United States, these giant raptors are found soaring high in the sky. Beware mistaking an immature Bald Eagle for a Golden; consult a good field guide for field marks. Golden and Bald Eagles are about the same size, with goldens being slightly heavier. Moving away from the Outer Banks somewhat, the Beasley Road (548) exit off of Highway 64, between Creswell and Plymouth, has been producing a few Cackling Geese and Greater White-fronted Geese this winter, mixed in with the large flocks of (wild and shy) Canada Geese. Tundra Swans and Snow Geese are present at times, also. A spotting scope is essential. Do not go beyond the gate, even if it is open. So, where to bird in February? I’d recommend sticking close by the ocean and other bodies of water for your best chance of seeing big numbers of birds and rare birds. Check the ocean piers for sea-ducks and razorbills. For rare gulls, check the beaches near the inlets, as well as Cape Point. For raptors, waterfowl, and other water birds, visit the nearby wildlife refuges. To keep up with recent sightings, you can use eBird and also join the Carolina Bird Club. In the backyard, keep the black oil sunflower seed out for cardinals and chickadees and look for Red-breasted Nuthatches, Goldfinches, Pine Siskins, and Purple Finches. Keep your fingers crossed for Evening Grosbeaks. Remember that a reliable source of clean water is important, even in winter. Also, this is a good time of year to clean out your birdhouses in anticipation of spring. I’ll see you in the field. Good birding! As Gymboree vacates the Outlets Nags Head shopping mall (formerly Tanger Outlets) in the wake of their recent bankruptcy filing, Outer Banks Olive Oil, Wine and Cigars will be moving in. Once again – another great birding article! Thanks so much for keeping these coming, Jeff. Great article! Love to read positive news about the unique fishing, birding, and history of the area.